The French Foreign Ministry has said the tape of a man claiming to be Osama Bin Laden and threatening the country seems authentic. The French authorities are treating the message from the tape “very, very seriously”. The audio tape was broadcast on Al-Jazeera network Wednesday and made very direct threats to France. The voice warned the country to remove their troops from Afghanistan and stop oppressing Muslims at home. The voice on the recording told the French that if they wanted to continue to “tyrannize” and believe it was their right to ban women from wearing a burqa then it was also their right to expect French forces from their land by “striking them in the neck”. The message was in reference to a recently passed legislation that bans women from facial coverings in public in France, which includes the burqa. 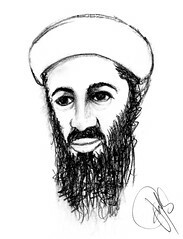 The voice being credited to Bin Laden also said that as the French people kill, imprison or threaten security they could expect the same in return. The alert level for France is on red which is the second highest level. However it was not changed in response to the tapes. The ministry stated that this merely confirms the reality of terrorist threats that authorities continue to fight against. The ministry also stated they will continue to fight terrorism alongside their partners. France currently has 3,750 troops in Afghanistan. The ban on facial coverings was approved in September and is set to take effect in the spring.